Home > Kids Deals > Kids Lunch Boxes starting at $5 Shipped! Kids Lunch Boxes starting at $5 Shipped! Here’s another fun Kohls deal today! I mentioned earlier that they are offering 20% off any purchase with code CYBERWEEK, well they are also offering FREE shipping on any order. Pair those two offers together and have a blast on cheap clearance deals!! 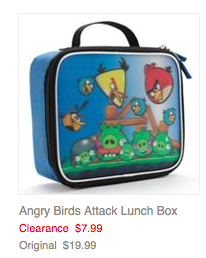 One thing that jumped out to me in the Clearance section was Kids lunch boxes. They have Disney princesses or Doc McStuffins, Legos and Angry Birds lunch totes on clearance for 50% off. 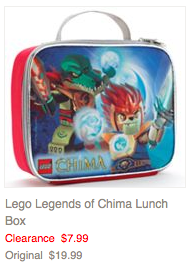 Grab any of these lunch boxes, and after the coupon code they are $4.79 to $7.99. These could be a great filler item too if you are trying to hit the $50 needed to earn $15 in Kohls cash.